The origins of Book Lovers Day are unclear, but that’s a common occurrence with unofficial holidays. Why should it matter anyway? What matters it all bookworms in the world have their own special holiday that was created to celebrate their love for reading. Books play a vital part in other world. Some people think that books are just a source of information, but they are so much more than that! Books allow us to visit other countries and fictional places, time-travel to the past and the future, and see the world through someone else’s eyes. Isn’t it exciting? There are many ways to celebrate Book Lovers Day. 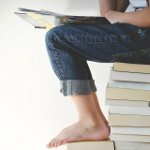 You can visit your local library, buy a new book, start reading a book you’ve wanted to read for a long time but haven’t gotten around to it, buy gifts for your fellow book lovers, dedicate the day to rearranging your books, participate in a book exchange, throw a book themed party… There are plenty of options! And don’t forget that one of the main goals of Book Lovers Day is to encourage people to read. So reach out to your friends to recommend them some of the books you love. We’re sure they’ll appreciate it!